Shiite leaders are up in arms over Saudi Arabia's execution of prominent cleric Nimr al-Nimr on terror charges. A senior Iranian Ayatollah called it a “crime,” while Tehran's Foreign Ministry accused Riyadh of supporting terrorists. "The Saudi government supports terrorists and takfiri [radical Sunni] extremists, while executing and suppressing critics inside the country," Foreign Ministry spokesman Hossein Jaber Ansari was quoted as saying by state news agency IRNA. "The execution of Sheikh al-Nimr is a service to Daesh (the Arabic abbreviation for ISIS), which is betting on expanding by igniting sectarian wars," said Humam Hamoudi, a prominent Shiite politician and member of the Islamic Supreme Council of Iraq (ISCI) party. According to a lawmaker from Iraq's ruling Shiite coalition, Saudi Arabia's execution of al-Nimr was intended to fuel Sunni-Shiite strife and "set the region on fire." "This measure taken by the ruling family [of Saudi Arabia] aims at reigniting the region, provoking sectarian fighting between Sunnis and Shiites," Mohammed al-Sayhud told al-Sumaria TV. Prominent Iraqis have called on the government in Baghdad on Saturday to cut ties with Riyadh over Sheikh Nimr al-Nimr's execution, al-Sumaria TV reported. "It's a big crime that has opened the gates of hell," Qasim al-Araji, the head of the Badr Organization in Iraq said, calling on Baghdad to cut diplomatic ties "immediately," according to the channel's website. Another Iran-backed militia group, Asaib Ahl al-Haq, has accused Saudi Arabia of seeking to provoke Sunni-Shiite strife, according to the TV's website. "What the use of having a Saudi embassy in Iraq?" it reportedly said. A prominent Iraqi Shiite cleric Moqtada al-Sadr called for demonstrations to take place in countries across the Gulf region to protest the execution of al-Nimr. "I ask that the Shiites of Saudi Arabia ... show courage in responding, even through peaceful demonstrations, and the same for the Shiites in the Gulf, so as to deter injustice and government terrorism in the future," he said on his website, as cited by Reuters. Meanwhile, Iran says it has summoned the Saudi charge d'affaires in Tehran, state television reported. Following the execution, Iranian lawmakers asked the Foreign Ministry to downgrade diplomatic ties with the Saudi government, FARS news agency reported. They proposed reducing the number of Saudi diplomats and consulates in Iran. Angry locals have also gathered outside the Saudi diplomatic mission in the capital to protest al-Nimr’s death. Elsewhere, in the Iranian holy city of Qom, dozens of men, some dressed in robes and turbans, marched through the city, holding up pictures of the dissident Saudi cleric. Al-Nimr's death has already added fuel to the fire in the boiling sectarian tensions in the Middle East. Police in Bahrain fired tear gas at several dozen people protesting al-Nimr's execution and carrying pictures of the cleric in a standoff in the Shi'ite Muslim village of Abu-Saiba, west of the capital Manama, an eyewitness told Reuters. Scores of Shiite Muslims have come out to protest in Qatif, one of the oldest settlements in eastern Saudi Arabia, against the government's execution of al-Nimr on Saturday, Reuters reported. The protesters reportedly chanted, "down with the Al Saud," referring to the name of the ruling Saudi royal family. They marched from al-Nimr's home village of al-Awamiya to the region's main town of Qatif, the only district in Saudi Arabia where Shiites are a majority. One of the most senior clerics in Shiite-majority Iran, Ahmad Khatami, said that al-Nimr's execution reflected the "criminal" character of the Saudi ruling family. "I have no doubt that this pure blood will stain the collar of the House of Saud and wipe them from the pages of history," Khatami, a member of the Assembly of Experts, was quoted as saying by the Mehr news agency. He added: "The crime of executing Sheikh Nimr is part of a criminal pattern by this treacherous family ... the Islamic world is expected to cry out and denounce this infamous regime as much as it can." Saudi Arabia summoned the Iranian ambassador in Riyadh over Iran’s "hostile" remarks on executions, according to the state news agency SPA. The ministry expressed “astonishment and its utter rejection of these hostile statements, which it deemed a blatant intervention in the kingdom's affairs." Kataib Hezbollah's leader, Abu Mahdi al-Mohandes, hailed the execution of Sheikh al-Nimr as “a crime that is added to the criminal record of Al Saud," he said, according to al-Ahd TV. 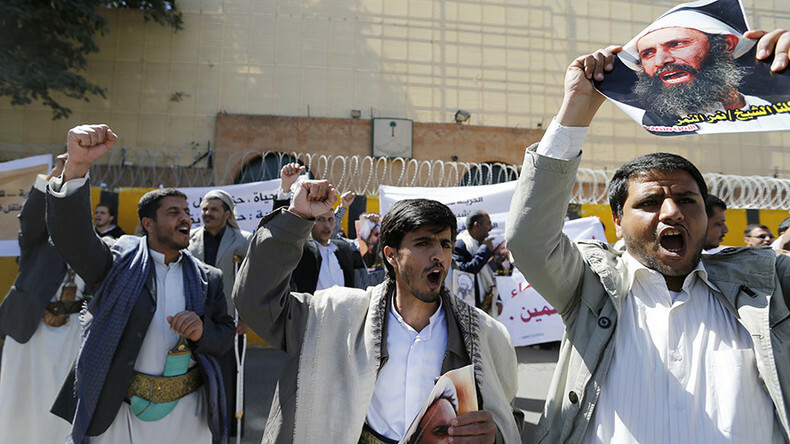 Yemen's Houthi movement has also mourned the prominent Shiite cleric, executed on Saturday. "The Al Saudi family executed today the holy warrior, the grand cleric Nimr Baqr al-Nimr after a mock trial ... a flagrant violation of human rights," an obituary on the Houthis' official Al Maseera website stated. According to Lebanon's Supreme Islamic Shiite Council, al-Nimr's capital punishment was a serious "mistake." "The execution of Sheikh Nimr was an execution of reason, moderation and dialogue," the council's vice president, Sheikh Abdel Amir Qabalan said in a statement. The brother of the executed cleric said he hopes that any reaction to al-Nimr's killing will be peaceful. “Saudi Arabia’s path to stability in the Eastern Province lies in ending systematic discrimination against Shia citizens, not in executions,” she said.